It was only a matter of time before Nuggets started exploring the oceans and lakes found across the planet. However, there isn’t really anything profound about their latest venture, as they merely set off in hopes of finding a quick meal. They’ll learn to appreciate the beauty of it eventually, I’m sure. Or, at least, we can only hope. IT'S WETTER, UNDER THE SEA! If there is a body of water on the planet, it will most certainly have fish in it. Fish come as a separate resource that is entirely dependent on the water level in the ocean/lake. Fish reproduce at a certain rate. If players fish too intensely and also use a lot of water from the ocean or lake (most likely a lake), the number of fish will deplete at a faster rate and reproduce more slowly. The water level defines the maximum amount of fish that the water source can contain. If the water level rises, the maximum fish value will go up and fish will start to reproduce more frequently again. If the number of fish in a water source reaches 0, the fish in that region will go extinct. Fish responsibly. When a Nugget reaches their favorite fishing spot, they will cast their line and wait for around 10-20 seconds. They will then proceed to pull a fish out of the water. The amount of fish captured after every successful catch varies from 1 to 5. The Nugget will repeat this action until their boat is full. Oceans and lakes will have schools of fish swimming around. When a Nugget is assigned as a fisherman, they will paddle away from the Fishing Hut and stop in a random location they deem suitable. They will then proceed to fish until their boat is full. Thereafter, they will return to the hut to begin gutting and cleaning the fish. At least, that’s what we assume they do. Once the fish have undergone this process, they will be converted into food. 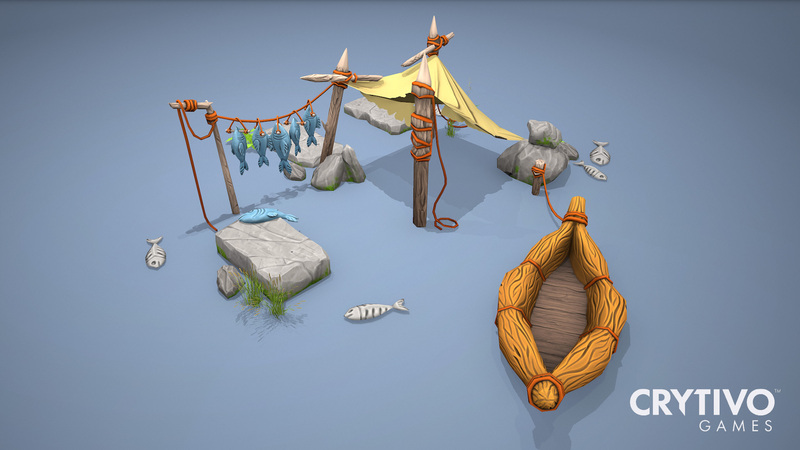 Every Fishing Hut has a limited storage capacity for food. However, the life of a fisherman isn’t always so peaceful. There are times when lakes and oceans may freeze over from the cold, which prevents Nuggets from catching any fish. If a Nugget was already out on the water when the freezing process occurred, they will be stuck there until the water source melts or you are kind enough to use your Creator Powers to bring them back to land. this is awesome project !